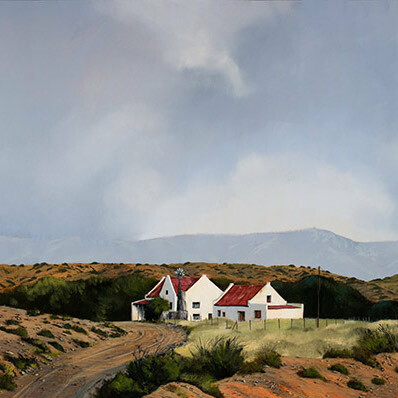 Another favoured small town of Donna’s, she has painted the houses in Klaarstroom fairly often, enjoying their timeless stature and structure, which has endured over the years. When Donna first came across this town, it had only one sand road and very dilapidated houses. Today it is a popular stopover and the homes and roads have been upgraded and renovated, leaving the town with a bit less charm than before. Klaarstroom is a village in Prince Albert Local Municipality in the Western Cape province of South Africa. It is situated at the northern end of Meiringspoort, about 60 km east of Prince Albert and 95 km north-west of Uniondale. Originally named Pietersburg, its present name, Afrikaans for ‘clear stream’, probably refers to waters flowing from the Swartberg into the lowlands.